Gray Duck Chai Available for Individual Purchase!!! The locally brewed chai that used to only be available for coffee shops can now be brought home. Both of Gray Duck Chai’s blends, 9 Spice and Burnt Sugar-Ginger, have been available for the past year to coffee shops exclusively, using a returnable growler system. Beginning July 1st both are now being sold in 32 ounce glass bottles as well. Gray Duck has had a very welcoming reception into the Twin Cities Coffee shop community. It turns out there are a lot of people who had been waiting for a more authentic, locally brewed chai to become available, something of the same quality as the coffee that is being roasted with such care. Now, Gray Duck is served in 20 different shops around the Twin Cities including Dogwood Coffee, Victory 44, and Quixotic. Even a few top cocktail spots like Café Maude Loring Park and Meritage Brasserie are creating some spicy libations with Gray Duck this summer. After being encouraged to go retail from their coffee shop following, and many of the supporters of their successful Kickstarter Campaign they are so excited about this next step. The new retail bottles are now available at many of the same coffee shops as well. In addition they can be found at Linden Hills Coop, North Loop Wine and Spirits, Oxendales Market, and Salty Tart Bakery; also coming soon to Kowalski’s on Grand Avenue and Hennepin. 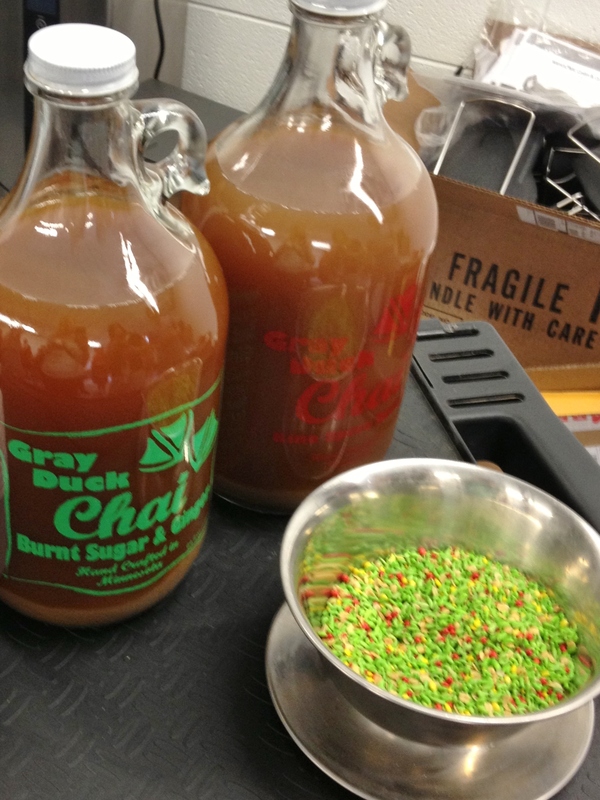 Gray Duck Chai is a brewed by hand in St.Paul by its owners, Katey Niebur and Jon Alden. Using traditional methods, 100% organic spices are milled by hand the day of brewing and steeped with fresh ginger and fair trade Assam tea from the region where chai originates in India. I had the wonderful opportunity to sample their Chai at the Caffeine Crawl that took place the past June. Members of their team were at Dogwood Coffee giving a presentation on the importance of good ingredients and providing information on authentic chai with strong notes of pepper and ginger. I have to say, I absolutely love their blends. They really hit the nail on the head. Their chai is perfectly spiced and can be served hot or cold. Now that you can purchase your own, I urge, go out and get it! If you haven’t already, check out their Facebook and Twitter profiles for news on updates, events, and more information on their chai.